The BMS system installed at Teleflex Medical controls the clean room air handling units as well as monitoring the operation of their medical device manufacturing machines for generating runtime time logs for each machine. The system monitors the electricity consumption for various sections of the plant, giving real time indications of the amount of energy being used. Pressure sensors mounted in the clean room area's monitor and log pressure differentials, alarms are generated if these differentials are exceeded. Mach Pro WebSys and Mach Stat controllers are used as the main controlling devices, with Mach Stat controllers used locally for system monitoring and adjustments. 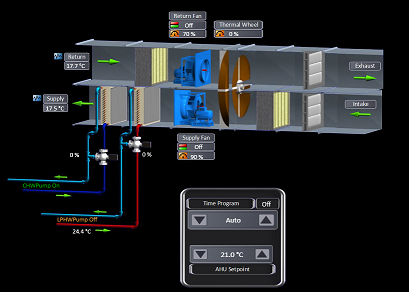 The Mach Pro WebSys is connected to the plant network, with the BMS available on all PC's through a web browser. VPN connections are also used for remote monitoring. A Mach Pro Com is used to connect to a series of Modbus energy meters to display and log the energy consumption in various areas of the building.